Homelessness has been a long-standing problem within our very own city of KL. The homeless are often victims of fraud, bankruptcy, violence, or runaways from broken families that simply have nowhere else to go. They are often ostracised from society because of the many negative perceptions surrounding them—that they’re useless, that they’re unclean, that they’re mentally ill or that they somehow “deserve” what they’re going through. 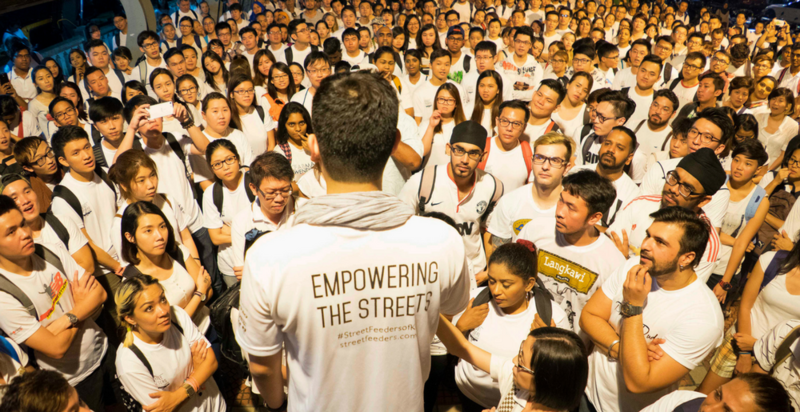 In 2011, Gary Liew started up Street Feeders of KL, a grassroots movement whose mission is to break these social stigmas and re-integrate the homeless back into society through counselling, street feedings, or simply sitting down and lending a willing ear to listen. Gary first started working with the homeless by helping his mom run a soup kitchen in Bukit Nanas that served lunch to 100 to 200 homeless daily. While assisting her in the kitchen, he would befriend the homeless people waiting outside for their meal. He realised he never noticed where his street friends slept at night, or who tended to their needs outside of the soup kitchen. At that point, he knew something needed to be done, but didn’t know how. The 29-year-old believes that being there for someone takes a lot of heart and is something that anyone can do if they sincerely wanted to. Their vision is to reach out and build relationships with the homeless that could help them reintegrate back into society. 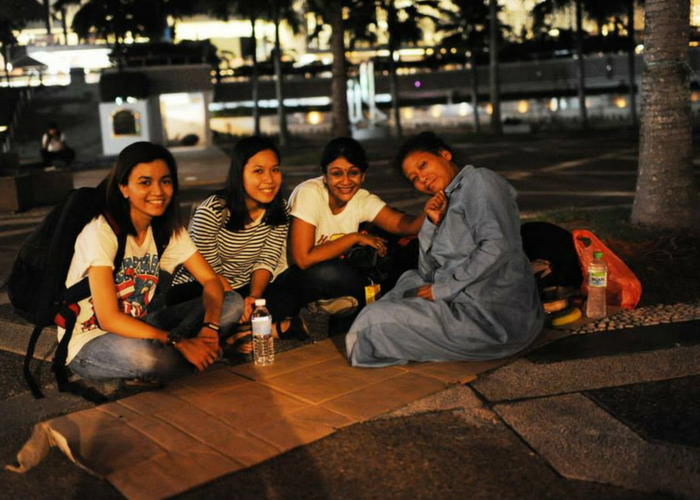 Volunteers taking time to bond on the streets. They manage this by arranging events from nightly feedings to open houses where they invite the homeless and volunteers alike to participate in a night of fun and bonding. For the Open House events, volunteers purchase tickets to join invited street friends and sit at the same table to share a meal. They also arrange community events for the homeless, such as the Free Night Market where anyone can get free supplies for their daily needs such as medical care, barber services, and job offers. The payment for the services are settled with a simple “please” and “thank you”. They also listen to homeless’ needs to ease their lives on the streets. 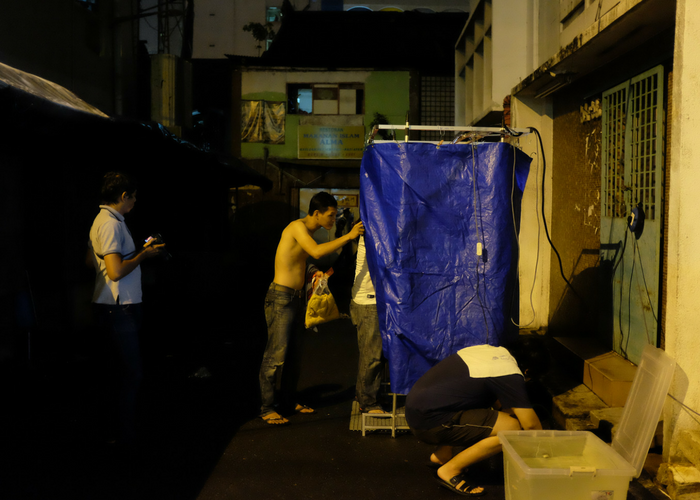 Just last year, they set up a mobile shower on the streets on alternate weeks to their feedings, and even brought everyone out for a movie just to forget their worries for the night. Initially self-funded, Street Feeders now gain income through the sales of their volunteer t-shirts. However, that amount is not enough to last even a few months and therefore no one on the team takes any salary as all the funds go towards their street projects for the homeless community. Currently they are moving on from street feedings to establishing a trusting relationship between the homeless and volunteers. Gary believes that providing food is merely the first way to reach out, and the bond-building that comes after is what makes it important. These days, their focus is on a project aptly named “Jalan-Jalan Cari Kawan”. Viva Starfish Project is a social business that provides jobs and shelter for the homeless, ex-prisoners and former drug addicts and graduates from rehab centres in order to give them a second chance at life. The profits of each bottle goes towards the education of underprivileged children as well. Their mission in this undertaking is to build on the existing relationships they already have with the use of Info Help Cards, which lists all the resources and contacts their street friends can use (e.g. where to get Medical Assistance, Shelter, Designated Feeding locations, Counselling, Welfare Aid). Having a firm belief for change, Gary believes that the first step to preventing homelessness starts at home. Volunteers distributing supplies to the homeless. Gary’s work is not limited to Malaysia alone, as he alternates within 8 cities to another to spread awareness on his work. Having just returned from Malacca, he will be covering KL and Seremban this weekend, then moving on to India in December. 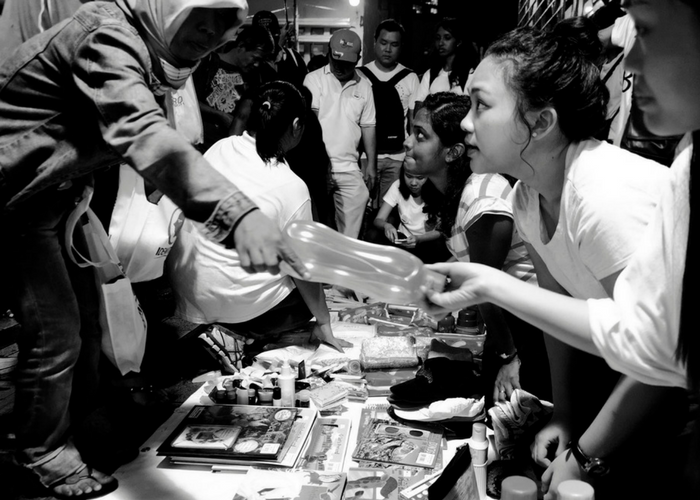 In 2016 out of 23 street feedings and one Free Night Market, Street Feeders of KL had 7254 volunteers, and fed and empowered 11,100 homeless people. However, society as a whole has a long way to go before the issue of homelessness can be fully addressed. One of team’s current challenges is to convince volunteers to sit and the same table and share food with the street friends. He told us the story of another friend, who thought he could never relate to the homeless community. Gary invited him to join the street feeding, and he went along. Gary believes that volunteering is important, but creating awareness by talking about it matters too.